U.S. Secretary of Energy, Dr. Ernest J. Moniz, visited the Hillhouse laboratory to see their innovations on photovoltaic materials and solution processed solar cells. The research of Hugh Hillhouse (Rehnberg Chair Professor, Chemical Engineering and CEI Member Faculty) has been funded by the U.S. Department of Energy’s SunShot Initiative for the last five years, and his team was selected by the SunShot program to highlight for the Secretary. 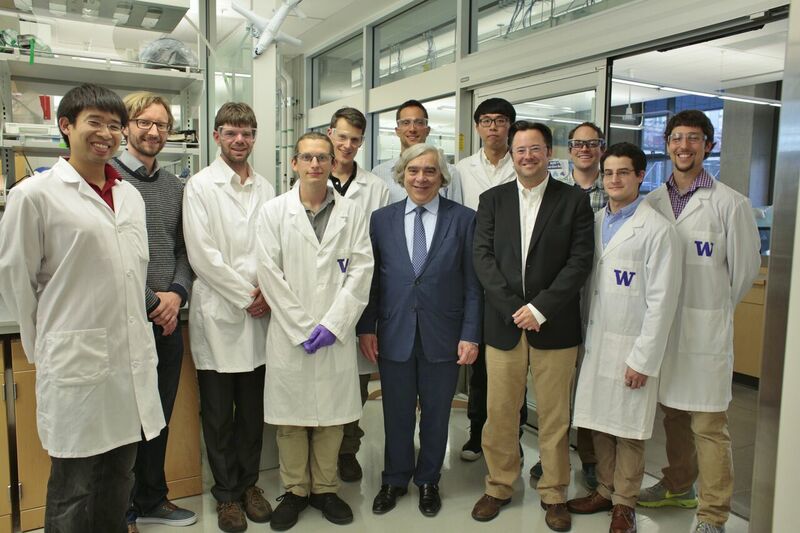 Secretary Moniz was visiting the University of Washington to speak at the Northwest Regional Clean Energy Innovation Partnership Workshop hosted by the Clean Energy Institute on August 15, 2016.